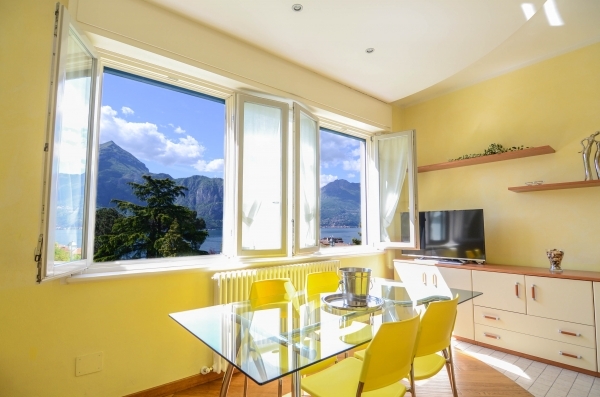 This beautiful one-bedroom apartment is located just uphill right next to the historical old center of Bellagio, overlooking both the park and the lake. There are several restaurants, cafes and a couple of wine bars within a few steps far. Il Parco has its own private garden and a garage which makes it a very convenient solution for whoever is coming to Bellagio by car and still wants to explore the town on foot. Il Parco is located on the first floor of a new building with an outdoor staircase leading up to the hallway and its entrance door. As you enter the apartment you have a complete picture of it with the dining room and the lounge in front of you and the kitchen right on your left-hand side, whereas the bedroom is at the end of the main room still on the left hand side and right next to the bathroom. On your right you have windows overlooking the lake and the park which makes the whole apartment very bright. The furniture and the use of yellow as a colour for the interior convey even more light to the environment. The bedroom is spacious with a big window, a wide modern wardrobe with sliding doors, a very comfortable bed with bedside tables and lamps all in the same modern style. Next to the bedroom there is a spacious modern bathroom with a walk-in shower and Italian tiles. The window overlooks the garden at the rear of the property.